Filled with mystery, excitement and the Doctor's trademark wit, these timeywimey stories will delight any Doctor Who fan! 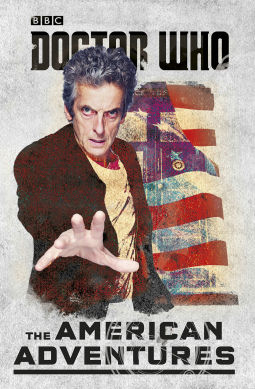 The Twelfth Doctor, sans companion, ventures through various eras of America in this all new novelization of everyone's favorite BBC series, Doctor Who. The American Adventures takes readers all over the U.S.A. from California to Florida. These 6 new adventures will fully capture a younger audience and perhaps make new fans. Even though the unique quirkiness of the Doctor doesn't take center stage in this set of stories, the action and adventure are there in spades. The Doctor mainly finds himself traveling through time and space to land in familiar moments of U.S. history, like during the California Gold Rush or the War of 1812. Between landing in an amusement park in Florida, in the year 2017, or stopping an lizard alien invasion before D-Day, there's a toss up between which of these stories is the best. 'Taking the Plunge' and 'Base of Operations' are the two most complex and intriguing. The American Adventures are geared for an audience that may not have the patience to sit through a lengthy, drawn out plot so if you're expecting the complexity of a classic Doctor Who episode, you won't find it here. Just the Doctor's cleverness and flair for finding trouble. Young readers will marvel at how quickly and efficiently the Doctor solves these mysteries and hopefully beg for more!